A 19th-century apartment renovated as an homage to a poem. Located in the heart of the Jewish quarters in Prague, this 19th-century apartment underwent a recent transformation. As part of The Emerald urban regeneration project by Urbanium Concept, the CollColl architecture collective renovated a former disused laundry hidden in an attic, five stories above the streets of the Old Town. The rest of the apartments in the building all went through their own restorations. Featuring different styles that also correspond to different moods, the dwellings now offer comfortable living spaces steeped in history. To design this particular creative space, the team of architects drew inspiration from the “Sentence” poem written by Siegfried Morkowitz and published in the BODY magazine. The ‘Rooftop Laundry’ apartment preserves the soul of the old structure while also enhancing its character. The BoysPlayNice photography studio captured the transformation in beautiful detail. Refined as well as inspired, the interior design scheme amplifies the atmosphere of the 19th-century building. At the same time, it offers the perfect balance between comfort and creative work space. Placed at the center of the apartment, the bed allows occasional sleep-overs. The studio features separates areas: a hall, kitchen, dining area, bathroom, and work area. 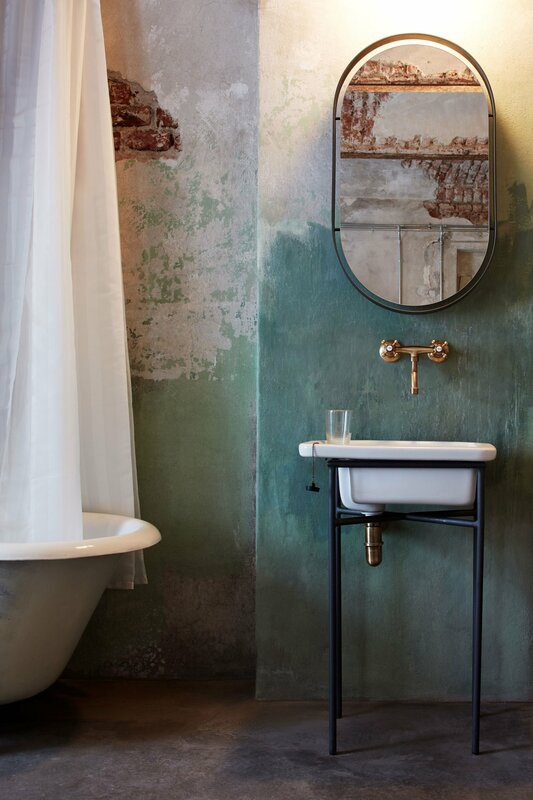 Kept in their original state, the walls add a striking textural richness to the décor. By contrast, the re-painted furniture and accessories are bright and spotless. Exposed pipes bring an industrial accent, while a new electric hob installed in an antique table preserves the old-time feel of the space. A freestanding bathtub becomes a focal point, inviting the inhabitant to relax while contemplating the winter sky through the nearby window. Photographs© Jakub Skokan, Martin Tůma/BoysPlayNice.